Introduction/Background: Clouds and Aerosols AG is rallying the community to conduct cloud measurement campaigns. Environmental Contamination (ECA) AG hopes to change direction to establish an Antarctic Monitoring and Assessment Program. Ocean, but needs to deliver the Trace Metals report first. Acidification AG is finalizing its report and presenting the results in many international forums. Remote Sensing AG is exploring the best ways to collect penguin (and other seabirds and seals) abundance data using remote sensing methods. The ATHENA EG is winding up its activities. GRAPE EG is initiating DemoGRAPE project to provide an empirical assessment of the delay and of the corruption induced by the ionosphere on satellite signals in the Polar Regions. ICED EG has been very active in promoting research on Southern Ocean ecosystems. The ICESTAR EG has been mostly inactive. IPICS EG is promoting ice coring campaigns. ISMASS EG is facilitating research on ice sheet mass balance. Operational Meteorology EG works to improve weather forecasts for Antarctica. ASPeCT devotes its energies to elucidating the role of sea ice in the climate system. ITASE provides an umbrella for traverse and shallow ice coring activities conducted by many countries and is planning follow-on activities. Important Issues or Factors: A new observing system is being proposed “Antarctic Near-Shore and Terrestrial Observing System (ANTOS)”. This is a cross-disciplinary project is proposed as an AG under SSG- LS but involving SSG-PS and SSG-GS. ATHENA EG is nearing the end of its activities so should be disbanded. ICESTAR EG should be disbanded because the group has been inactive for several years. ASPeCT should become an EG because it does not have a definite home within the SCAR structure at the moment. It has an expected long lifetime that fits with an EG designation. ICED EG (joint with Life Sciences) should become a co-sponsored activity of SCAR. This fits better with its change of direction. Two new AGs are proposed under SSG-PS: SERAnt (Sun Earth Relationships and Antarctica) to replace ICESTAR, and SnowAnt (Snow in Antarctica). Proposals for these two new AGs are included in Appendix 2. SSG-PS is examining ways to start to realize the Horzion Scan research priorities. Recommendations/Actions and Justification: Number 1. SCAR requests that national programs which operate shipping in the sea ice zone participate, where possible, in the underway sea ice data collection according to the ASPeCt protocols. Number 2. SCAR encourages national programs to continue to make their meteorological data available in near real time to global weather forecast centres and to make observations from ships and aircraft where possible. Number 3. SSG-PS recommends that AAA SRP be continued for a further 4 years at the present funding level. Number 4. SCAR endorses the freely available, but non-commercial, GIS package “Quantarctica” and allows re-distribution SCAR datasets as part of Quantarctica. 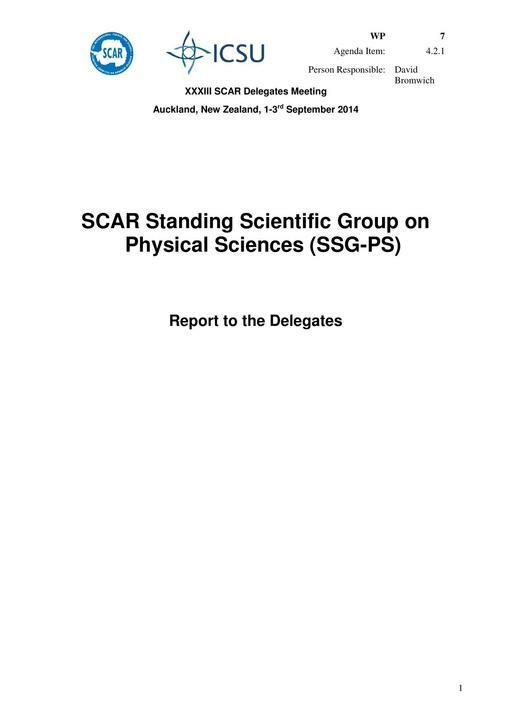 SCAR recommends multiple theme editors from each standing group. These editors select peer-reviewed publicly available datasets that will be included in Quantarctica. Expected Benefits/Outcomes: Recommendations 1 and 2 encourage important data collection while number 4 facilitates data usage. Recommendation 4 recognizes the success of AAA SRP, and encourages its continuation. Partners: ANTOS will involve all SSGs, and work with the new SRPs, plus SOOS, CEP, CCAMLR and national Antarctic programs. Budget Implications: $27,000 is requested for each of 2015 and 2016 to support SSG-PS activities.